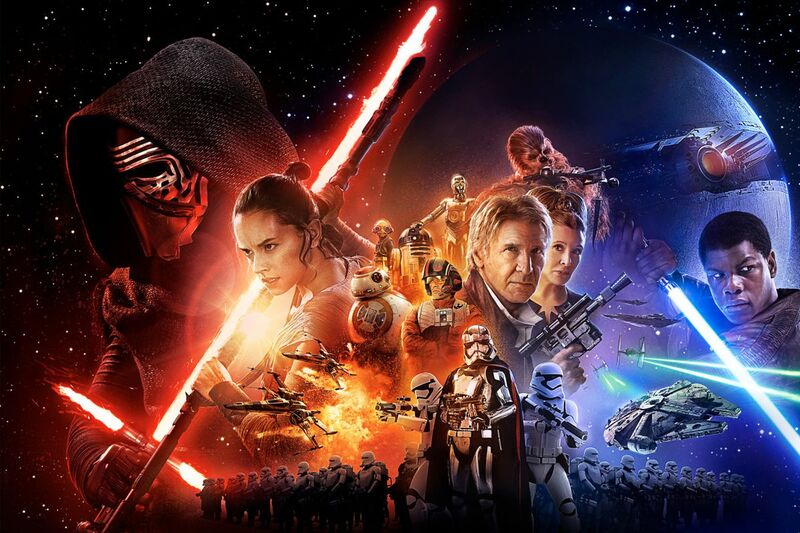 Star Wars Movie List – It's Media, Darling! Star Wars has and forever will hold a special place in my heart. Some of my earliest memories are of my sisters and I crying at my father’s feet because we broke the VCR and couldn’t watch the Ewoks. Throughout my life, Star Wars has been there for me, even longer and more consistently than Magic the Gathering! I don’t normally like to discuss the things I like or don’t like about Star Wars. The fandom is so diverse and so big that it feels as if you’re supposed to be picking sides. I don’t like to pick sides of anything, and the reality is, I like Star Wars enough to power through most of the awful stuff. Some of the movies I’ve seen hundreds of times. Some of the movies I put on in the background while I ignore them. Some of them I skip entirely. I’ve exhausted myself over the years defending the things I like and don’t like about the movies (and the books and games but that’s another post entirely) so that’s not what I’m doing here. There’s a big difference between what I like and what is good cinema too, I’m experienced enough in the world of critiques to know that, so, I’m just gonna write the first things that come to my mind about these movies and what I like or don’t like about it. Harmless, and fun, right? I won’t rank them (except for my favorite two), so they’ll just be in order, mostly. Revenge of the Sith – IN MY PERSONAL OPINION, this is the best Star Wars movie they’ve made. The fall of Anakin and the rise of Darth Vader IS WAY COOL. Some of the best R2-D2 moments of all time are here and literally, every actor/ character in this place acted their butts off and it is glorious. The whole thing is fabulous Order 66 is meaningful and powerful. The fight scenes are awesome. The graphics are great. There are too many gifs to share so just watch this movie again and pay attention. A New Hope – Not a bad movie, but defo a boring one. Grand Moff Tarkin steals the show, and if there was more of him this movie probably would have been gold, now it is like a bit of rock with flecks of gold in it. (Han Shot First btw). Also. Obi-wan rocks on the oneliners again. The Empire Strikes Back – Better than Clones (or is it? I can never decide) Luke with Yoda on Dagobah is really awesome (only for Yoda, Luke is like bland pudding), but there’s not enough Leia, nor enough Lando, and of course, the epic revelation and lightsaber fight scene between Luke and Vader is priceless, timeless and epic. Return of the Jedi – Ewoks are life. Fite me! Their antics to this day make me giggle. I hate the Leia outfit. DON’T EVEN GET ME STARTED, but Leia kills Jabba fights A BUNCH and that’s cool. The rise of Anakin pairs so nicely with the rise of Darth Vader in ep 3 that this is probably my second favorite of the series, despite the weird hero complexes everywhere and the long pacing and meh I felt about Han through most of this movie. The Force Awakens – Bland. Somehow blander than Luke in ep 4. I’m still not over Luke having VANISHED, though I’m not sure if that makes me madder than the midichlorians or not. Poe & Fin are cool. Snoke should have been cooler. Rey’s obsession with her family is dull and I’m still not sure how she learned to pilot. The Last Jedi – Rey is somehow more boring. Kylo stops being annoying and starts being somehow cooler. Luke is weird like Yoda now, which though funny and appropriate defo was not handled well. The writing here feels forced and it seems like half the movie is missing. Snoke deserved better and so did Leia, Poe, Phasma and Lando. Rogue One – I really enjoyed this movie. Mostly. The actors were splendid, the fight scenes were epic, but the pacing of the movie is weird, the triple backstab plots were tedious. MORE DEATHSTAR? EW. The untimely and pointless deaths of half the characters they didn’t give enough screentime seemed forced. I hated Donny Yen’s character so much I literally didn’t bother remembering his name but Jyn Erso, her dad and the dude in the white cape are interesting characters (unlike Rey) so I’ll take it. Solo – A fun ride. I liked all of the characters (WHICH IS LIKE A FIRST FOR ME IN A STAR WARS MOVIE PROBABLY). The acting was superb. The costumes and the cinematography were beautiful. I hated we didn’t see a younger Han (at least in mention). Meeting Chewbacca was not as I wanted, but Lando and L3-37 were enough to carry me through. Overall though I hated the Space Kraken, and the escape scenes were overdone and sort of rewrote some of the previous things which was in poor taste at best, and unnecessary at worst. a designer and writer with 5+ years in the digital marketing field. She spends her days trolling Facebook, playing all sorts of games and absorbing media. Some of her favorite things include, Dragon Age, Star Wars, My Little Pony, Dragonriders of Pern and other fantasy worlds where one can examine themselves as an author and consumer. This blog is currently a Work in Progress so please bear with me as I get the ball rolling!